We have a variety of breeds of chickens which lay eggs in multiple colors: green, blue, white, dark chocolate brown, and brown. The birds are free ranging and provided foraging opportunities. They are given a natural, no animal byproduct grain, as well as fresh fruit and vegetables. 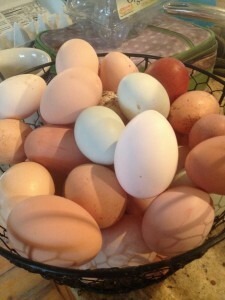 Eggs are $5 a dozen and$2.50/half or $7.50/18 pack. Duck eggs are $6/dozen and $3/half and available on request. Either call or email to ensure as we sell out early most days.